This Mini portable White LED Emergency Lamp is highly useful in the event of an unexpected power failure. It gives sufficient light in the room. It is too small and is an ideal utility gadget for the use in camp places during journey. It can be plugged in just like a Mobile charger. The Emergency lamp has 3 High bright White LEDs and a 9 volt rechargeable battery and the whole circuit including the battery can be enclosed in a small adapter box with plug in pins. Charging voltage is obtained directly from the 230 volt AC using a Capacitor power supply. C1 is the X rated AC capacitor used to drop 230 volt AC to around 12 volt AC which rectified by the full wave diode bridge comprising D1 through D4. Resistor R2 prevents the inrush current and R1 remove the stored current from C1 when unplugged. Capacitor C2 is the smoothing capacitor and the ripple free DC will be available for charging. Since the unit is always plugged in, minimum current is allowed by R3 for charging. When mains power is available, D5 forward biases and battery charges through R3. At the same time, the PNP transistor T1 will be switched off by the positive bias obtained from the diode bridge. So LEDs will be off. When power fails, base of T1 becomes negative and it conducts and current passes from the battery through T1 to light the LEDs. You can enclose the circuit and battery in an old adapter box with pins. Caution: The circuit is extremely dangerous since there is no galvanic isolation. Try the circuit only if you are an experienced person working in AC circuits. 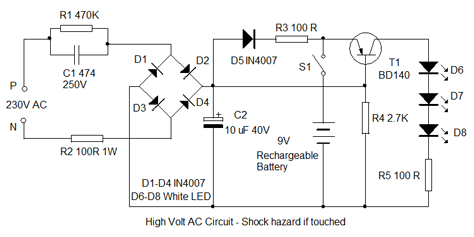 Do not touch or trouble shoot when the circuit is connected to mains to avoid shock hazards. Have you tested this circuit????? Oh…means it is tested !!!!!!! I just want to make the co-readers remember a good old trick, to use fluorescent stickers near the switchboards and on the walls in most of the places (of course, not in sun-lit houses) so that when power goes off, one can find his way out atleast, without searching for the alternate illumination …. OR here is the circuit by our master Sri D.Mohan Kumar!